Praline Pumpkin Date MuffinsIf desired, substitute Nut Quick Bread Mix and omit pecans in muffins. Decrease baking time 5 minutes. Making Large Batch of Cocoa MixI have 3 children. My oldest is in middle school and changes classrooms throughout the day. My younger kids are in a title 1 school and also have many specialized teachers that they see every day. Star by the Christmas TreeStar is my 7 year old Miniature Cocker Spaniel. We adopted her last year just before Christmas from our local animal shelter. Star loves to cuddle up with you on the couch, she loves to run around the yard and chew her rawhide toys. A New Use for the Changing TableAfter your baby is potty trained you can re-purpose that changing table. Remove the pad and any safety belt. Turn upside down and drill holes in each leg for pivot wheels. Handmade JournalA handmade journal for memories, lists, and recipes. Made of fine paper and a beautiful photo, you may want to make one for yourself as well! Doris' Christmas TraditionWhen my first child was 4 years old, I decided to start a Christmas tradition that was inexpensive but fun. My son, Joe, was old enough to chew hard candy (with supervision). 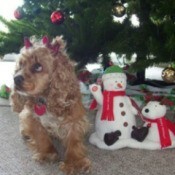 I bought him a "LifeSaver" Christmas box of LifeSavers that had a small ornament attached. .. Covered MatchboxMatches dressed up for the holidays! 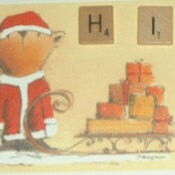 Small rectangular matchboxes covered with gift-wrap. These also would make nice gift boxes for dolls. Miniature Snowmen OrnamentsTiny little snowmen bundled up in scarves and hats. 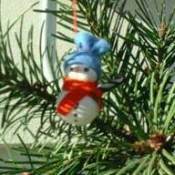 Perfect for your Christmas tree. 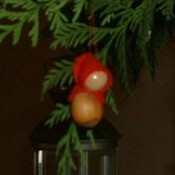 Jingle Bell OrnamentsThis is simple but children love it. 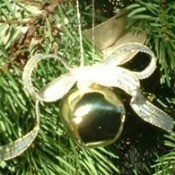 Decorate silver or gold store bought jingle bells with a sparkling ribbon and ring accordingly! Red Riding Hood OrnamentsFew can resist these tiny ornaments - cheerful ladies with red head kerchiefs and hazelnut skirts dancing on an evergreen bough. Santa JokeIf Santa rode a motorcycle, what kind would it be? Inexpensive (Earth Friendly) Christmas GiftI'm a bit low on money this holiday season, so I was trying to think of homemade gift ideas, and came up with this. 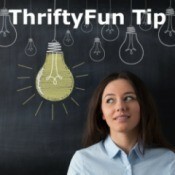 It's thrifty, it helps recycle, and it's environmentally safe! All great things! I have a few "recipes" for natural, non-toxic cleaners that I got from a co-op natural foods store. 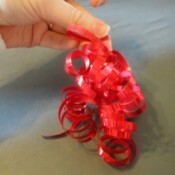 Make a Curly Ribbon CascadeDon't spend money on those fancy curly ribbon cascades. Make your own! 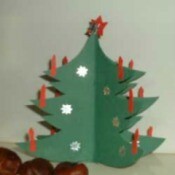 Three-dimensional Paper Christmas TreeTrue to its name, a three-dimensional tree of thick green paper, covered with silver stars. Scrabble Tile Alphabet MagnetsFor the kid in all of us. 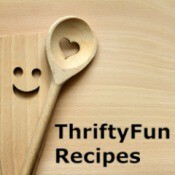 Pick up a used Scrabble game at the thrift store and create a set of alphabet magnets to grace a fridge door! 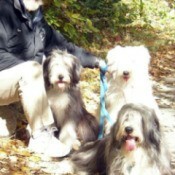 Farley, Toby and Ruby (Bearded Collies)My husband on a fall hike with our Bearded Collies. Farley is white and was adopted from the Humane Society in 1996 - what a sweet boy. We believe that he is a mix - not sure. Farley started the furball rolling! Fleece Blankets for the WinterFleece blankets are great, but costly if the quality is good. Now the fabric stores have their fleece on sale-mostly 50% off. 4 yards will be a good size and will cover the top (only) of a queen bed. We have one on the bed and with a bedspread or other cover on top, it never has fallen off. Watercolor Art CardsThese striking cards are surprisingly easy to make when you choose simple, bold images such as flowers to paint. 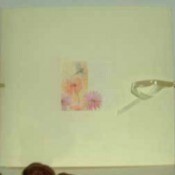 Pasted onto card stock, they make an enchanting gift for a mother or beloved friend. Mr. DanishThis is my gorgeous kitten Mr. Danish. He is from one of my cat's litters. He is absolutely gorgeous. Peg Bracken's Sesame CookiesI found this site while serching for Peg Bracken. I remember she had a recipe for Those Good Sesame Cookies. I can't find it in any of my remaing copies of her books. Drat that urge to clear out the old stuff. 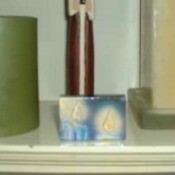 Making Aromatic Room FreshenersI have your recipe for gel air freshener. Now I need your recipe for aromatic room fresheners, made with alcohol (vodka for one). Narrow Measuring SpoonsHas anyone ever used or heard of narrow measuring spoons? They are supposed to eliminate spilling and wasting spices when measuring from narrow mouth jars. Also, does anyone have any tips other than special spoons to prevent the spilling? 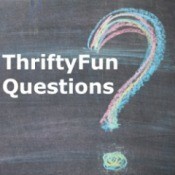 Why do some light bulbs stick in the fixture?Why do some light bulbs stick in the fixtures? I've noticed this mostly in my bathrooms, so I'm assuming it may have something to do with moisture causing rust. What can prevent this, once I get this bulb out, besides replacing the entire fixture?